Today we are going to talk about toffee, vegan toffee to be specific. 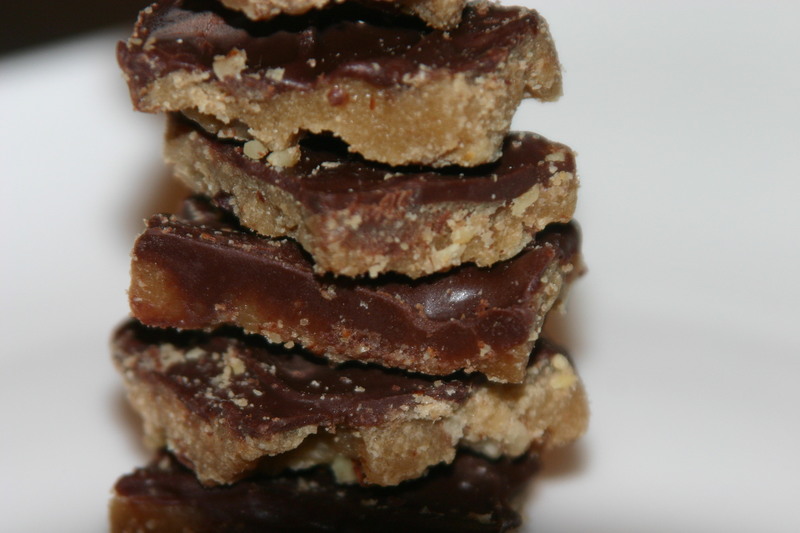 It is actually amazingly easy to make vegan toffee, nothing special required. Just replace the butter with vegan “butter”, I like Earth Balance, and make sure your chocolate chips are vegan. If you don’t just want to eat this for some reason, or want to dress up your ice cream feel free to crumble it a bit and dump it over the top. Or sprinkle it on your waffles, or dip a banana in the pieces that fell off in the pan while when you cut it. A very versatile cookie. I have to confess I did not actually make vegan toffee this year. I’m sorry to disappoint you. I did get vegan toffee in my cookie box from my mom. I immediately hid it in the back of the fridge so my husband wouldn’t find it. While he was at work today I took it out and took pictures of it. Just because I didn’t make it doesn’t mean you should have to suffer a holiday season without vegan toffee. Don’t worry, my mom doesn’t mind. I keep my toffee in the fridge and it lasts a pretty long time if you hide it well enough. heat the sugar and butter to boiling, stirring constantly. Boil and stir for 7 minutes. Immediately spread mixture evenly over nuts in pan. Sprinkle chocolate chips over hot mixture, cover baking pan with a cookie sheet or foil right away and let the captured heat soften the chocolate chips. Remove cover and spread the softened chips over the toffee like frosting. While still warm, cut the toffee into 1 ½ in. squares. Note: this makes a 9×9 pan of toffee, it can easily be doubled for a 9×13 pan if you have to share with anyone, or mail it to your daughter. These cookies are amazing and this is from an avid eater of meat. I’m quite glad that she is my sister-in-law.